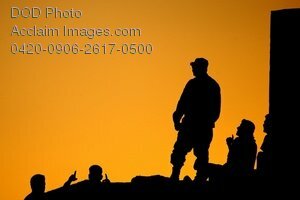 Description: Free, public domain image: Iraqi Air Force Soldiers Standing On Top of a Bunker at Sunset. Members of the Iraqi Air Force, perched atop a bunker,watch U.S. Air Force and Iraqi Air Force members compete against each other in a friendly soccer match at New Al Muthana Air Base, Iraq on June 20, 2008. The match was hosted by the Coalition Air Force Training Team. U.S. Air Force photo/Tech. Sgt. Jeffrey Alle.